Home Loss Prevention Technology Loss Prevention Data: Who’s Responsible? Listening to loss prevention leaders discuss their relationships with information technology (IT) departments and offer advice for strengthening them can seem a bit like eavesdropping on marriage counseling. There is admission of a “love-hate” dynamic, occasional hand-wringing over who gets final say, and counsel to “listen, don’t just talk” and to “see things from their perspective.” There is a critical difference, however. No matter how uphill the battle, divorce is never an option. Loss prevention needs IT. These departments must team successfully to manage technology in retail stores. More functions of retail security than ever depend on support from technology departments. LP needs IT permission to put technology solutions on the network and increasingly relies on IT for access to the loss prevention data and the optimization of IP technologies to effectively perform their function. “I simply can’t do my job without them,” explained Virginia French, an investigator at Brinker International, whose brands include Chili’s Grill & Bar. French says she needs her IT partners to provide timely access to a variety of data sets, so she can keep pace with the latest employee fraud or theft scheme. “My job is absolutely crippled if I can’t get the data,” she said. As more loss prevention technologies migrate to the network and LP increasingly plays in IT’s sandbox of data, IT departments have become indispensable to loss prevention and asset protection (AP) functions. We rely on them for both the implementation and success of asset protection systems and to fully realize the value that our departments can provide our companies. Macy’s, for example, has been aggressively pursuing big data projects for years, and tapping into it has been a focus of its AP and LP departments, according to Thomas Smith, systems and technology manager in Macy’s asset protection division. 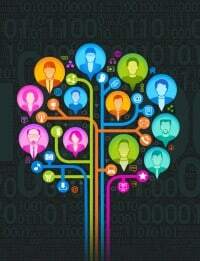 “Within the data systems they maintain is all the return information, all the transaction info, and all the marketing information. So we’re looking at all this data and thinking about how we can use that in AP and with our own analytics to make us more efficient and identify issues we haven’t seen before,” said Smith. It’s already had a payoff. Macy’s recently closed several major refund fraud cases, organized retail crime cases, and major insider thefts by digging deeper into its loss prevention data—with a key assist from IT. Clearly, the stakes of effective collaboration with technology departments are extremely high. So how’s it going? Extremely well, if you ask loss prevention executives. In a national security survey on the question, LP pros rated their level of cohesion with technology departments significantly better than security counterparts in other industries. 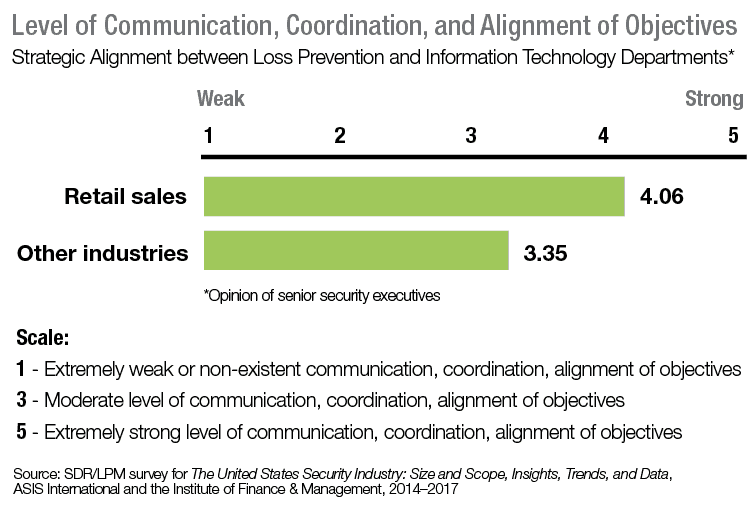 Case in point: fewer than 4 percent of loss prevention executives rated their alignment with IT as particularly weak, a score of 1 or 2 on a 5-point scale (see table). But that’s not to say there aren’t challenges and potential pitfalls. Talking with IT isn’t always easy. Cultural and operational differences may exist and act as barriers to effective collaboration. Priorities and project timelines are often at odds. Setbacks occur and can be triggered by even small events like the departure of key personnel. LP Magazine spoke with a dozen leaders in the LP industry, and they seemed to unanimously agree that understanding and avoiding the potential causes of disconnect between IT and LP is as critical as any management challenge facing LP pros today. So what’s the secret to a happy marriage? Read the full article, “Building an Unbreakable LP-IT Bond,” to find out. The original article was published in 2017. This excerpt was updated August 2, 2018.